5.67 points at 12 votes (rank 700). Just standing around dozily, why not? 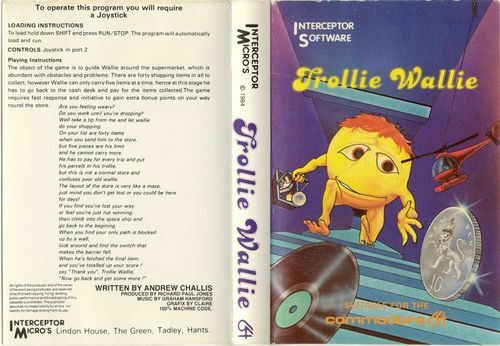 Trollie Wallie is an arcade game with 4-way scrolling by Interceptor Software from 1984. The name-giving hero or dork of the game is Wallie: a gnome reminding one of an orange with stumpy arms and dentures of a predatory dinosaur, whose exclaimed aim it is to collect 40 items (joysticks, cabbage, AC/DC records, but no beer crates!) from the local supermarket. 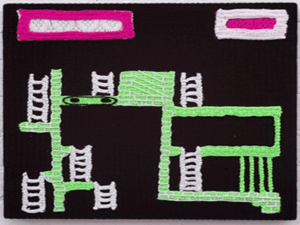 This consists, as it is a must for a proper supermarket, of a labyrinth of green and purple bricks, stuffed with deadly traps, slides, wandering barriers and monsters, in which the goods are placed at the most unreachable locations that you can imagine. 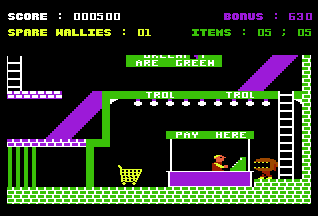 As Wallie was stupid enough to leave his trollie at the cash desk, he can only pick up five items at a time, whereupon he has to run to the cash desk to pay after which only he is able to go back and collect more consumer goods. A timer, which starts with every check out at the cash desk at 1000 points and then counts down slowly, awards quick and aggressive acting with bonus points. Each contact with monsters or dangerous items as well as falls from a height of more than Wallies own body size, tear the pawn into exactly four parts and cost with this one of five screen lives. There are no bonus lives...tough as nails! Attributs as e.g. "filigree" or "playful" do probably not cross ones mind when looking at the graphics in the game: rather "bulky", "edged" and "approx. as interesting as an empty beer crate". 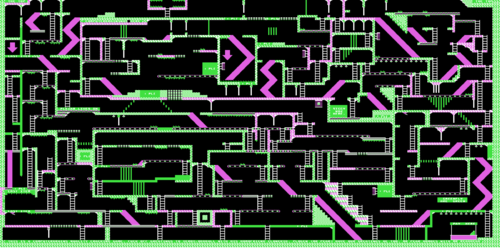 The predominant colours here are green, purple and black - a truely timeless unaesthetic combination just as it is appreciated in retrogames. The scrolling into the four main directions is realised quite ok, but in the case it has to be scrolled diagonally, when Wallie uses a slide, there is a very ugly jittering. During loading of the original an image created by the programmer's sister was shown, which in its downright exemplary nameable grand-naive workmanship would probably have a good chance of being amongst the top 20 when voting for the "most bizarre loading screen of all times". What is striking - for all parts of the Wallie trilogy- is the inability of programmers and cover designers to agree on a consentaneous design of the title character. 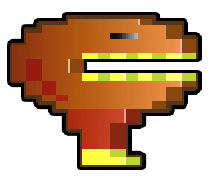 So on the cover and in the loading screen we are presented with a bright yellow gnome with red tuft of hair, but in the game itself we see the seemingly far more threatening snappy orange. Carelessness? Intention? Is this wanted like this? And who has rolled the cheese to the station? For the sound they resorted to the proven methods, which is stealing ideas of others, to say it more precisely, you get to hear a well 9-minute long mix of Popcorn (Hot Butter/Kingsley) and Equinoxe part 5, 6 and 7 by J.M. Jarre, which for the year 1984 was done surprisingly well. By the lachrymose character of the Equinoxe parts it cannot be ruled out that - paired with the high difficulty grade - a certain melancholy is spread on the player after a longer time. The highscore table is not saved, so that you cannot avoid to chisel the scores into very heavy marble plates which are a must-have in every well-led household. That's something we need to practice some more. Map of the game (click to enlarge). While the game runs type ← , M , U , G one after the other. 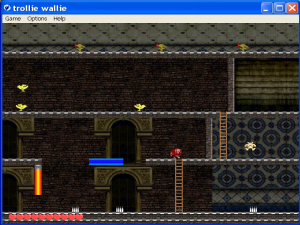 "Cheat mode" appears at the upper border of the screen and Wallie is from now on immune against collisions with enemies and obstacles as well as against falls from great heights. 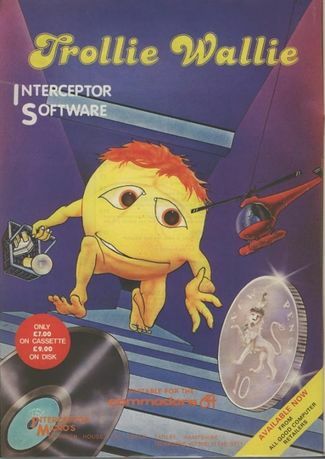 Robotron2084: "Great graphics and animation, ideal level design, great speech output...yes, Impossible Mission is a great game, but back to Trollie Wallie, which is: Interceptor Software's version of Son of Blagger, which was probably used as "inspirational source". There are not many good things that come to my mind for this title, but als not many bad things either, except for maybe that the game has only one "level", which you of course have cased relatively fast, if you were determined to do so. The fact, that after collecting the last item you are given a mess of pottage with a disdainful "Game Over" makes this undertaking not very attractive, the high difficulty grade does the rest. Because pixel exact jumping, as already demonstrated in Jet Set Willy, Booga Boo and co., is unfortunately also here a daily occurence and quickly leads to teeth grinding and premature going grey in some places. And do we really want that? Trollie Wallie breathes virtually a mean towards you in almost all areas, only the music is capable of giving this cranky game the certain something for a short time, which you search in the game itself nearly in vain. Trollie Wallie is like a visit to a grumpy fellow who you already know for ages, who always treats you bad, has never anything new to tell and whose number you strangely have never deleted from the telephone list. 5 out of 10 points." FXXS: "At the beginning you are indeed put off by graphics and slightly unfair dead ends and it is also not nice that you have to restart from the very beginning again and again, but if you have made it to the cashier, there is something like a routine and also fun in the game that can take place. 7 points if you can live with it, that it feels like being on the technical status of the beginning of 1983." The manuals of all parts of the Wallie trilogy are written in rhymes to address a younger audience. 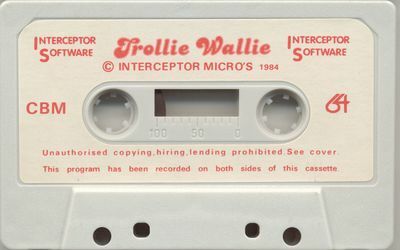 Trollie Wallie is one of the few games by Interceptor Software, in which no more or less obvious insult against Jeff Minter and his company Llamasoft can be found. They liked to hide disrespectful messages in highscore tables, manuals and scroll texts (e.g. "Llamaburges" in Burger Time or "Jeff the jippy Jester" in Cuddly Cuburt). At once location in the game there is the message "Plexar lives on", a clear relation to the inscription of "Plexar was here" from the second level of Fort Apocalypse. Also you have to collect the generically blue helicopter from the game. 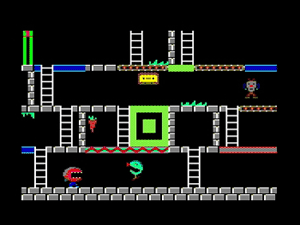 Amstrad CPC version...typically Amstrad-like again exaggerated in colour. Crocheted version on fibre board! The author of the article tries very hard to play as dumb as possible. 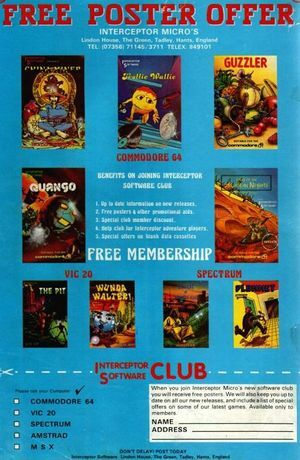 Trollie Wallie in an advertisment for the Interceptor Software Club. This page was last modified on 30 September 2017, at 03:07. This page has been accessed 6,359 times.